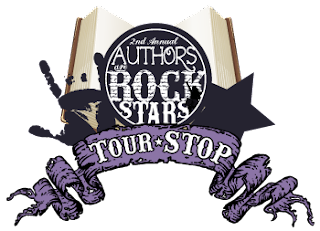 Welcome to my stop on the Authors are Rockstars Tour hosted by Fiktshun, Two Chicks on Books, and Magical Urban Fantasy Reads! I have the extreme pleasure of hosting Chloe Jacobs on the tour and I could not have been happier with the author I was paired with. For my stop, I have an interview with Chloe Jacobs and she brought Isaac along with her. Why I think Chloe Jacobs is a Rockstar? Chloe is a rockstar for so so so many reasons. First, I guess I should start with the fantastic book she wrote, Greta and the Goblin King. I adored that book and the whole world she created. Not only did she create an awesome world, but she also created wonderful characters. Greta is such a strong heroine who is so easy to root for. Then there is Isaac, who is just so easy to fall in love with. Along with her awesome book, she is also one of the nicest authors out there. You can always find her interacting with readers and she is also very very funny. There are so many reasons I think Chloe is a rockstar and I highly encourage everyone to read her book! Isaac: *chuckle* Of course, Danem Teresa. It is lovely to meet you, but you do realize that by saying my given name you’ve now invited me into your dreams. Are you certain you’re prepared for the consequences of such a choice? Perhaps I will let you off the hook this time. In any case, I’m very happy to be here. Our esteemed writer friend believed I would be the – *looks at Chloe with raised brows* – lesser of two evils? Since Danem Greta tends to be a tad…abrasive. Chloe: *biting lip* Yes, that’s the right way to say it…although I’m still debating whether I made a mistake bringing either of you. *shaking finger* You better behave. Isaac: *innocent look* What could possibly happen? Chloe, can you take a second to describe Greta and the Goblin King in less than five sentences for those who may not have read it? Isaac: I can answer this question. Isaac: You seem to have something stuck in your throat, Danem. Chloe, if you had to describe yourself in two words what would they be and why? Same question for you Isaac? Isaac: While our esteemed writer friend here is talented, yes, she’s also quite prejudiced. Isaac: Did you know that she didn’t give me—ME, the KING—my own point of view, throughout her entire story? Chloe: Wait, that’s not fair. It was Greta’s story. It had to be told from her point of view. Chloe: And at least you get to have your own point of view in book 2, so that’s good, right? Okay, maybe we need to move on…because I am a sap, Isaac what words would you choose to describe Greta? Chloe: That’s four words…and they all mean the same thing. Isaac: I felt it was necessary to drive that point home. 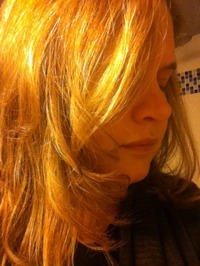 But she is also compassionate, intelligent, resourceful…*intense look* and MINE. So Chloe, I have to know. What inspired the world you created in Greta and the Goblin King? Isaac: I can answer this question, Danem Teresa. Isaac: I think it is obvious that her inspiration was…me. Chloe: Actually, I was inspired originally by the opportunity to write a twisted fairy tale. Something that hadn’t been done too often already. After I explored the initial idea, however, I realized that the real story wasn’t in the forest with the Witch, it was in Mylena where there are more than just witches, there are also goblins , ghouls, ogres, faeries, and an eclipse that turns them all into raging monsters. Isaac: I think I take exception to that. Isaac, what is it like living in that crazy world of yours? Anything you wish Chloe could have “forgotten” to include? Isaac: Ahem, well. There may be one or two things done under the influence of the moons that I’m not very proud of…and I think there are some intensely private interactions between me and Danem Greta that didn’t have to be put out there for everyone to read. Chloe: But that’s the stuff that our readers really want to see! Chloe, what are you working on now (if you are allowed to tell us)? Anything particularly interesting *cough*Isaac*cough*? Chloe: Right now, book 2 is being edited. I’m hoping it’s not too long a process, so that I can have a release date for the readers very soon! Chloe what is the best advice you have ever gotten? Isaac same for you? Chloe: Someone once told me to just do what I can and not worry about the rest, because I would never be able to please everyone anyway. Of course, we all hear that, but I didn’t really take it to heart until I found myself so stressed out by all the balls I had up in the air, that I’d landed myself in the hospital. Now, I look at things a lot differently. I live my life for me and my family, prioritize everything else accordingly, and it’s really helped me to be more relaxed and a TON happier. Isaac: Strangely enough, the best advice I’ve ever received came from Danem Greta, who said that she wanted her life to mean something, to make a difference to someone. I’ve been thinking more and more about this, and come to some interesting decisions lately. Perhaps this is something that you’ll find out more about in subsequent stories. Pink or Purple? Chloe: Purple. Coke or Pepsi? Chloe: Can I pick coffee? Vanilla or Chocolate? Chloe: Vanilla, always! Wizards or Vampires? Isaac: *raised eyebrows* … Chloe: Uh, I think I better pick Goblins. Rain or Sun? Isaac: We don’t have rain in Mylena…or much sun either. I’m not sure what it would feel like to live in such a world. Dinner or Dessert? Isaac: I don’t know what this “dessert” is? In Mylena we have one meal…the one you can pick or catch yourself. Power or Love? Isaac: I am the King. I will have both. Isaac: Do not apologize for me, Danem Chloe. The human is obviously more intelligent than you, and appreciates my point of view. Thank you so much for dropping by! It was an absolute pleasure to have you here. And yes Isaac, I think we all appreciate your point of view. 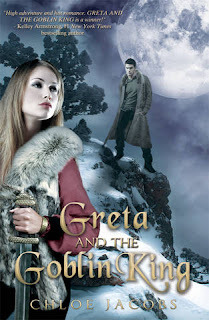 I have one signed copy of Great and the Goblin King to giveaway courtesy of the author. I haven't read her book yet, it sounds like one I would really enjoy. Fun interview! I'm hoping to read Greta and the Goblin King at some point. Thanks for sharing! Chloe is right, we readers enjoyed those private moments between Isaac and Greta ;) What a fun interview - this was a favorite book I read last year! Loved Greta can't wait for book 2! Thanks so much for being a tour host! I haven't read any of Chloe's books yet, but I'm dying to! I agree making up your own world and writing a book is pretty rock star-ish. Because authors are pretty awesome! Because she is an amazing author!! Because she spends her life surrounded by boys. I am the only girl in my family too. I havent read her books yet but she seems like an amazing author. She sounds pretty great although I have yet to read one of her books! Thanks for blurbing her up! I'm sure to love her. Chloe is a rock star because she has incredible world-building and character development skills! And is just an all around fantastic author! Chloe Jacobs is a rockstar because with her first book she enchanted me and made want to know about Greta and Isaac and their world. Chloe's a rockstar because she writes books that freakin rock! Because she wrote what looks like an awesome book! Because she writes good YA books. I freaking ADORED this book. She's a rockstar because she managed to make me think that goblins could be hot! Who would have thunk it?! I have been wanting to read this book for a while. It looks so good. She is a rock star because she did that awesome character interview!